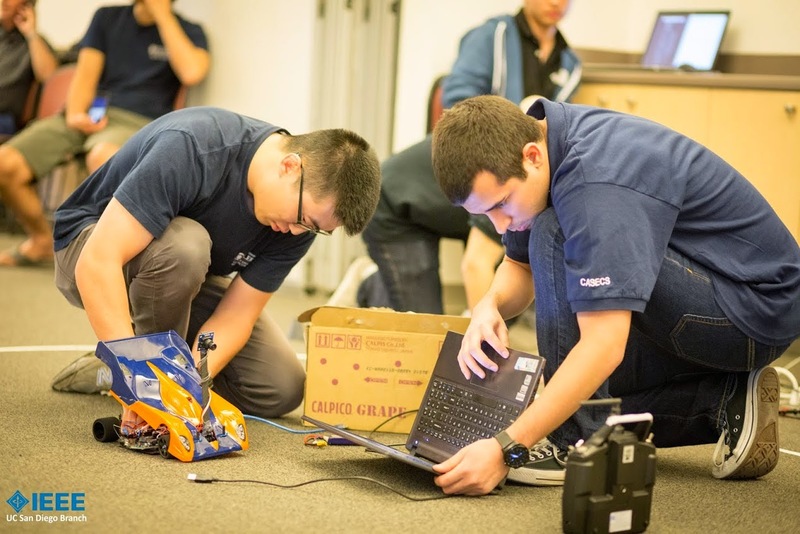 Twenty one teams from around California vied for first place in the GrandPrIEEE competition organized by the UC San Diego branch of IEEE Sunday April 19. In the end, two teams from Cal State Fullerton took first and second place and a team from UCLA took third place. The first UC San Diego team placed 10th. The challenge was to design, test and build an autonomous vehicle that could navigate around a track in the shortest amount of time possible. The track was marked on a dark colored carpet with white tape, which in turn covered a wire delivering a 75 kHz sinusoidal signal. The winning team made its way around the track in 16.70 seconds. By comparison, the last team took 55.21 seconds. Imagine that you have an idea that could change the way a part of the world or the world as a whole functions – perhaps it is a customizable electric longboard or a device that gamifys Nanoengineering (just two of the ideas percolating at the Jacobs School of Engineering at UC San Diego). Now imagine you were given the chance to explain your idea to a panel of judges in just 60 seconds – could you do it? As a function of “The Basement” at UC San Diego – a campus-wide enterprise operated by Alumni & Community Engagement and dedicated to UC San Diego’s entrepreneurial community – students across all disciplines were given the opportunity to do just that at the Moxie Center Pitchfest, which takes place every quarter. “No sign-ups, no requirements,” the quarterly event signage boasts. “Together, my partner Aditya Bansal and I founded Trainio, and we are currently developing the SpeedTrain device,” said Cohen. “This is the first device to give individual athletes and coaches of all levels the ability to intelligently improve their speed/agility and train smarter. “The SpeedTrain device features easy to set-up wireless sensors that go on the track/field/training surface and connect with your smartphone to effortlessly record, track, and analyze your speeds in a variety of agility and sprinting exercises. “Furthermore, the SpeedTrain app provides feedback and training suggestions custom to your sport(s) and your training results to provide you with the best possible competitive advantage. “In recent years, new technology and the capabilities of smartphones combined with the Internet of Things has revolutionized many industries, but athletic training cannot yet be included in that list. Our goal at Trainio is to use this new technology to develop better athletic training solutions for athletes and coaches of all sports and across all levels of those sports. Cohen took home the judge’s choice award ($100) for his business pitch. In line with his entrepreneurial interests, Cohen is a highly decorated athlete (soccer, skiing, you name it!) and certified referee. He served as goal-keeper for the UC San Diego Men’s Soccer team for four years (the maximum allowed by the NCAA). Outside of entrepreneurism and athletics, Cohen has participated in numerous design projects as an engineering student, including the Max Tech and Beyond Design Competition and the UC San Diego Entrepreneur Challenge. “Slithr Electric Vehicles is developing customizable electric longboards for urban commuters, tech enthusiasts, and action sport junkies,” said Demolder. “With our adaptable module, our unit can fit on any longboard or skateboard deck allowing users to customize their vehicle to match the rider’s height, weight, and skill level. We offer a 13 mile range through our drive hub motors and low friction Shark Wheels that gives our electric longboard a non-intrusive design. To control the speed and acceleration of our 2000 Watt vehicle, users have the option of using a wireless hardware controller, a smartphone app, or the Myo Armband. Demolder, who is CEO & Head Engineer at Slithr Electric Vehicles, took home the audience choice award ($50) for his business pitch. Outside of building his company, Demolder has interned with Advanced Projects Research, Inc. and tutored math students. “My idea is to take simulations of atomic systems into virtual reality using new Head Mounted Displays – the displays provide a hands on approach to learning about the fundamental forces in our universe by allowing the players to build atoms,” said McCloskey. “They also create a fully immersive 3D modeling environment for building atomic structures including crystal structures, chemicals, and biological systems. We are currently using Oculus Rifts. “We are gamifying the entire process of becoming a Nanoengineer to make Nanoengineering more accessible to millions of people around the world. As the player progresses through the game, each achievement/level-up instructs the player in tangible Nanoengineering skills as they interact with simulated atoms. At the end of the game, players unlock a sandbox mode where they can freely build and simulate atomic systems, as well as design materials-dependent 3D printable files. “In 5-10 years, I see millions of players developing new nanotechnologies using our software, collaborating in virtual spaces and self-organized groups. The software represents a decentralized, crowd-sourced approach to space exploration and the enrichment of our life on Earth. Aside from McCloskey’s interest in entrepreneurism, he serves as a materials science research assistant and captain of the UC San Diego Men’s Rugby team. McCloskey has also taken part in the annual Triton Junkyard Derby, put on by the Triton Engineering Student Council. “I'm working with Joseph Le (Computer Science,) Mike Shi (Math/CS,) and Thomas Chang (Human Computer Interaction), and our idea focuses on providing a platform that allows users to explore the world and share their adventures via a Google map-like interface that results in a photo/video map of the world,” said Hill. “We want you to see breaking news, historical wonders, local celebrations and much more, all through the eyes of those who are there to experience them live. “The concept is brand new, and we are only a recent admit to The Basement, so it's hard to tell exactly where my team and I will end up. However, I know our entrepreneurial spirit will push us to continue working, even if the idea doesn't. We've talked to a few large venture capitalist firms in the bay area, and the idea really found traction with two of them." In addition to his involvement with The Basement, Hill currently serves as an officer for the Triton Engineering Student Council and as Professional Development Chair for the Computer Science and Engineering Society. Stay tuned for more as we keep up with these engineering entrepreneurs! There are only 16 total teams left in the running for the University of San Diego’s Social Innovation Challenge and the remaining teams have been divided into two tracks: USD and San Diego-wide. Of the eight teams in the San Diego-wide track, five teams hail from UC San Diego. We are proud to share the continued accomplishments of Bystanders to Upstanders, Combatting HIV Transmittance in Mozambique - Africa, Evocado, People’s Potty Project (3P) and VivaScope. In the final round, the teams are perfecting their 6-minute pitches on their social innovation projects. The teams will present to a live panel of judges next Tuesday, April 28 and the recipients of seed funding prizes will be announced at the awards ceremony held on May 1. At the awards ceremony, all contestants will present a 90-second fast pitch of their project to the San Diego social innovation community. “The Social Innovation Challenge is looking to fund projects with social impact and a sustainable model,” said Bystanders to Upstanders (B2U) CEO Sneha Jayaprakash. Jayaprakash founded Bystanders to Upstanders with the mission to make volunteer work more efficient through personifying, localizing and gamifying community service. Since Jayaprakash began her company, B2U has pivoted from a non-profit to a for-profit model focusing on encouraging volunteer work in corporate settings. Jayaprakash explained that between each round, the Social Innovation Challenge holds Idea labs, each with a different agenda to continue developing their projects and their pitches. While she mentioned that some lessons have overlapped with tips and training received from the von Liebig Entrepreneurism Center and the Rady School of Management’s joint incubator mystartupxx, Jayaprakash also believes that the competition has been helpful in working out the finer points of her team’s business model and crafting a balanced presentation. Kirk Hutchinson of VivaScope recommends the experience and says that the competition is a chance to practice communicating your passion to strangers, a key to any successful humanitarian project. VivaScope is a Global Teams in Engineering Service team partnered with the student organization, Engineering World Health. Their project seeks to expand the availability of viral load testing by reducing costs that prevent millions from receiving the care they need. Receiving award funding is the cherry on top of the learning experience. Next Tuesday, the live pitches will be open to the public. To find out more information on how to attend the final round or RSVP for the awards ceremony, click here. A team of undergraduate computer science students completed their final project for their CSE 190 class, taught by alum Chris Barngrover: an autonomous robot that follows a remote-controlled helicopter around. They started off with a TurtleBot, a low cost personal robot kit equipped with open source software. The robot includes a Kinect and a netbook. Students used the open-source Robot Operating Software to program its tasks. The students are: Frank Bogart, Mike Lara, James Lee and Kenny Yokoyama. We're impressed with the results! Research Expo 2015 took place Thursday April 16, 2015 and featured a poster session, faculty lightning talks, and an award ceremony and networking reception. The event was a success, thanks to our judges, sponsors and the Jacobs School faculty, staff, and students. As a way to recognize the hard work of the graduate students who presented a poster at the event, a grand prize and the Rudee Outstanding Poster Award was presented to the poster deemed “best in show” by the judges. In addition, smaller prizes and awards were given to the presenters of one poster in each department who were able to articulate the meaning of their research extraordinarily well. Congratulations to all of our winners, and to all who presented a poster at Research Expo 2015! Research Expo is this Thursday, April 16. So far in our Meet the Engineers of Tomorrow series, we’ve introduced you to two of the engineering graduate students that are presenting a poster at this year’s event: Oscar Beijbom, with a poster titled “Automated annotation of coral reef survey images” and Vineet Pandey who’s poster is titled, “Connecting stories and learning objectives increases participant motivation in online discussions”. In this, our final post leading up to Research Expo 2015, Michael Frank and Steven Naleway describe the wonders that lie at the intersection of biology and design. Everyone in the McKittrick lab has to have an animal – meaning they should each be studying and analyzing the structure and mechanical behavior of natural biological materials like shells, bones, teeth and tusks for design applications. According to Frank, sea urchins are fascinating because of their versatile mouthparts – an apparatus termed Aristotle’s Lantern – which allows them to persist at different depths. It actually looks more like “The Claw” from Toy Story. Urchins have conquered most sea habitats because their mouthparts allow them to be incredibly precise when taking in food, much like a claw is able to grab an item out of a vending machine. Frank and his colleagues outsourced the prototyping of their design to a team of students in the MAE 156 capstone design course for seniors. 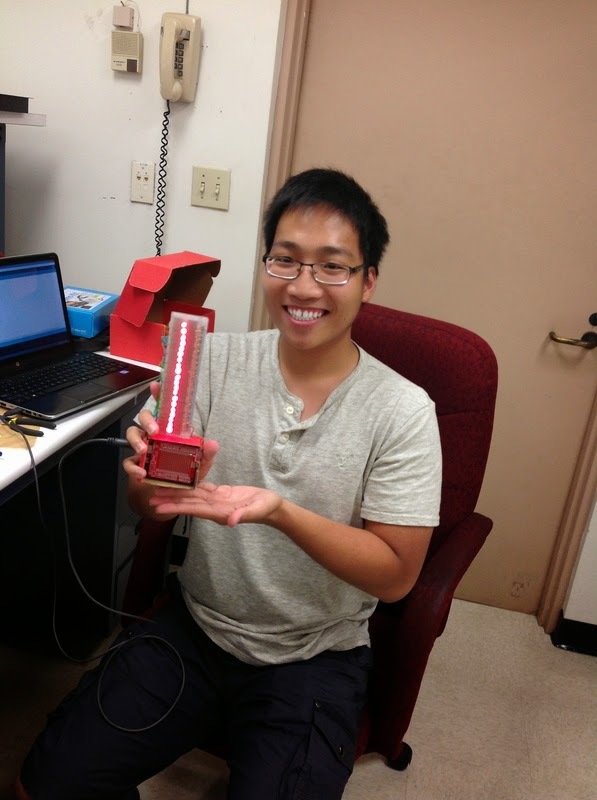 He and his colleagues then attached the bioinspired sampler to a rover for testing on the beach and again with Mars simulant provided by professor of structural engineering Yu Qiao’s group. Frank hopes to be able to see NASA adopt the design. He says that the Rady School of Business at UC San Diego has opened his eyes to startups and entrepreneurship, and he’d like to see it through. While Naleway is an author on the poster (titled “Microstructure and bioinspired application of Aristotle’s Lantern: Urchins from the Sea to Mars”), he has his own bioinspired research – box fish armor. In addition to their work on Aristotle’s Lantern, Frank and Naleway will both present posters at Research Expo on freeze casting – a physical process using the directional freezing of water to make porous scaffolds similar to the spongy layer of bone and a number of other biological materials. Naleway will present a poster titled “Easing the fabrication of bioinspired composites through the use of clathrate hydrates in freeze casting” and Frank will present on “Magnetic freeze casting: porous scaffolds bio-inspired by bone”. In 1997, a group of engineering students from the University of California, San Diego heard about the Formula SAE competition – a student design competition organized by SAE International (formerly Society of Automotive Engineers). The idea behind the competition is that a fictional manufacturing company has contracted a design team to develop a small formula-style race car, which will be evaluated for its potential as a production item. Intrigued by the challenge, the student group gathered in a garage and put their textbook knowledge to work. With the completion of a race car built from scratch, Triton Racing was born. Triton Racing is UC San Diego’s Formula SAE team, and it continues to produce cutting-edge race cars for the annual Formula SAE competition, held this year at Lincoln Airpark in Lincoln, Nebraska June 17-20, 2015. The competition tests the ability of the students to apply their engineering knowledge and encompasses all aspects of the automotive industry including research, design, manufacturing, testing, developing, marketing, management and finances. The student-led group at the UC San Diego Jacobs School of Engineering grows in numbers and knowledge each year. Nathaniel Goldberg, a sophomore mechanical engineering student and Director of Public Relations for the team, felt that the process of taking a car from production to competition should be documented on film. He and his teammates are making that happen. With the production of the 2015 car already underway, Goldberg is bringing in filmmaker and UC San Diego student Keita Funakawa to begin work on what he hopes will be an invaluable documentary. “This year’s car is going to be highly competitive, which is one reason we want to film the process leading up to competition.” said Goldberg. Want to know why? Check out the unique design of the 2015 car, TR-15, on the Jacobs School website! Yawo Ezunkpe is one of six UC San Diego Ph.D. students to be accepted into the Bouchet Graduate Honor Society for 2014-2015. Named for the first African-American doctoral recipient in the United States, Edward Alexander Bouchet, the society seeks to develop a national network of preeminent scholars who exemplify academic excellence and foster environments that support students who are traditionally underrepresented in academia. UC San Diego was the first university on the West Coast to establish a chapter of the national organization. 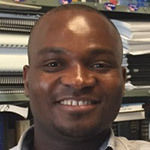 Ezunkpe’s research interests include fluid mechanics and applied and computational mathematics. His dissertation focuses on stochastic analysis of fluid flows in domains whose rough surfaces are modeled as random fields. His work addresses some of the unresolved theoretical and practical questions concerning differential equations defined on random domains. It has significant impact on biological flows and could be extended to other areas where surface roughness affects fluid flows, such as environmental engineering and nanoscale devices. Last month, 17 UC San Diego teams advanced to the semi-finals of the Social Innovation Challenge hosted by the University of San Diego Center for Peace and Commerce. We are proud to announce that six out of those 17 teams hail from the Jacobs School of Engineering’s Entrepreneurism and Leadership programs. Bystanders to Upstanders, CaroSoul, Fiji Kindergarten Project, One Village Philippines, VivaScope and Wastelights await the announcement of the teams to compete in the final round at the end of this week. 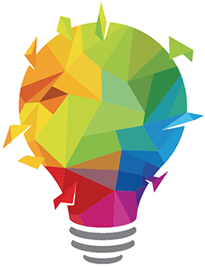 The Social Innovation Challenge aims to promote, guide and support student-driven ideas to launch or contribute to social enterprises, leveraging the university’s Center for Peace and Commerce as the initiative’s catalyst and mentor. The first USD Social Innovation Challenge was held in 2011 and had 16 submitted projects. This year, the SIC received project submissions from 100 student teams, and since their first challenge in 2011, the SIC has awarded over $150,000 in cash prizes to student projects that present novel, sustainable and effective solutions for social problems. The teams that make it to the third, final round will pitch their ideas in front of a live panel of experts. Bystanders to Upstanders developed an application that aims to effectively engage people in communities and promote volunteer work through the power of social media and game design. In their Social Innovation project, the team wrote: “the ultimate goal is to lead our users toward a more socially conscious lifestyle.” Their application hopes to localize, personalize and gamify community service, allowing “local volunteer event planners who do not have the means necessary to raise awareness for their cause [by making] events with [their] platform and reach[ing] out to a larger community than they would be able to access by themselves.” Bystanders to Upstanders is a team at Mystartupxx, a UC San Diego accelerator supported by the von Liebig Entpreneurism Center and Rady School of Management to promote female entrepreneurship. Another Mystartupxx team, CaroSoul is a sustainable wetsuit company with a focus on decreasing landfill neoprene wetsuit waste and creating quality women’s wetsuits. Founder and CEO Caroline McCandless is a Masters student at the Scripps Institution of Oceanography in the Center for Marine Biodiversity and Conservation and has been surfing since she was seven years old. Her inspiration and drive for the project is drawn from her experience and love for the natural world, as a surfer and San Diego environmentalist. McCandless explained that “Neoprene is petroleum based synthetic material that is difficult to breakdown… when it goes into landfills, it says in landfills.” CaroSoul has established a wetsuit recycling campaign with six drop-off locations in San Diego and hopes to expand its operations. Global TIES: Fiji Kindergarten Project works to create a kindergarten center in Taveuni, Fiji out of recycled shipping containers. Project lead Cathy Yu compares the costs a sustainable center versus a traditional one, explaining that “through the use of sustainable engineering, we are able to create a kindergarten center with a composting toilet, potable sink and rainwater harvesting catchment for less than $10,000, while a normal brick and mortar kindergarten center would cost an upwards of $25,000 electricity.” Yu reflected on how the Global Teams in Engineering Service program brought their team members together, stating that without the program, the group would not have been able to connect with their client in Fiji and mobilize students from all over the university to put their education to use through a tangible project. One Village Philippines’s project is their solar powered street lamp, a vehicle for ending poverty in Philippine communities. The team has designed the street lamp to be affordable, sustainable and reproducible for the low-income communities in the Philippines that they serve. Project lead Minh Dao told us that the team work aims to provide an environmentally-friendly and affordable lighting system to low-income communities and foster entrepreneurship within the Philippines. One Village Philippines has had on-going projects with the Global TIES program for four years now, and Dao said "we were motivated to compete in the USD Social Innovation Challenge and other social innovation competitions alike by our TIES faculty advisor, Dr. Mandy Bratton and Undergraduate Advisor, Caitlyn Smith." VivaScope is working towards expanding the availability of viral load testing in the developing world by providing a novel system that will dramatically reduce costs for tests. VivaScope’s project tackles the costs that prevent millions of people from receiving the care that they need. Project lead Kirk Hutchison explained that VivaScope reduces costs significantly from $10,000 per machine and $20 per test to $1000 per device and $5 per test. VivaScope is a partnership between Global TIES and Engineering World Health, a UC San Diego student organization. “We are all working on this project because we truly believe in the importance of our goals and our ability to make a positive difference in the world through the application of our engineering skills,” said Hutchison. The Wastelights team aims to eliminate waste by converting it into a source of energy—making sewage into electricity and kitchen waste into biofuel and biochar. Wastelights, led by Joyce Sunday, hopes to create three different types of systems: small, medium and large for portable, home and power grid units. The team has already created a basic prototype and is supported by the Moxie Center for Student Entrepreneurship and the von Liebig Entrepreneurism Center. Wastelights has also completed the NSF I-Corps Program. Congratulations to our teams on their accomplishments! We are so proud of their social innovation projects and we wish them luck in advancing to the finals! Divergent Engineering (divE) is a self-funded UC San Diego student organization with a mission to provide a supportive environment for engineers and scientists and an opportunity to explore different facets of engineering and challenge their creativity. Students who are ready to dive into engineering projects are encouraged to meet the members of Divergent Engineering at their Spring Quarter Pitch Day on Wednesday, April 8. All students and faculty are invited to attend and hear divE’s team members pitch both their new and current projects at the CMRR Wolf Auditorium from 1pm to 4pm. 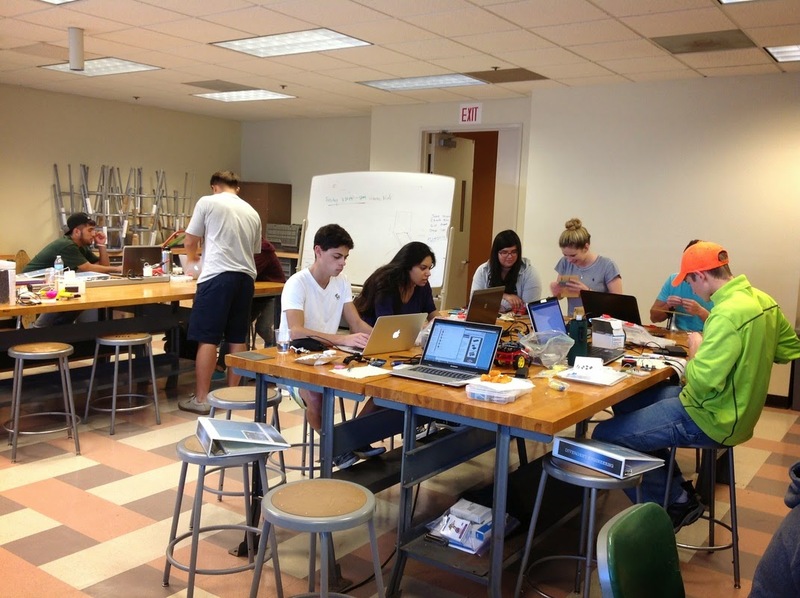 "We’re a student-run engineering incubator that aims to provide an encouraging community for students to work together, tinker, challenge, and engineer. Our core values lie at the openness to learn, the drive for innovation, the courage to fail, the friendships that are formed, the willingness to lift others, and most importantly, having fun! We want to nurture these values and allow the students to translate them over to their leadership, communication, and engineering through our workshop and our team environment." Founded in summer 2014, Divergent Engineering began as an Arduino microcontroller workshop for six students before eventually becoming an incubator and community for students of all majors to pitch ideas and work on projects, as well as a self-funded UC San Diego student organization. “For our very first workshop, we bought the [microcontroller] parts, got together at Geisel in study room 2 and we programmed and worked,” said Phuong Truong, one of the three Divergent Engineering presidents. 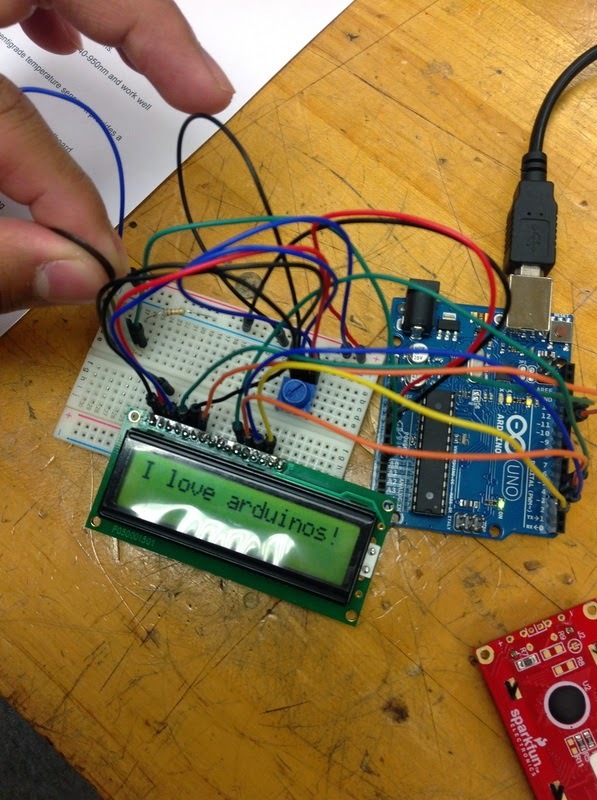 After the first Arduino workshop, the six students were then able to teach other students from a local community college about microcontroller programming. In a single month, they produced a working data logger, persistence of a vision wand, a Skittle sorter and a wall-avoiding robot. Divergent Engineering founders and organization presidents Karcher Morris, Alex Phan and Phuong Truong explain that it was the success of the first workshop and the passion of this first group of students that served as their proof of concept– that an interdisciplinary group of students interested in engineering projects would not only be special, but very powerful. “Our projects are a mixture of a variety of fields, they allow students to be creative, appreciate the other majors and have a real opportunity to be a real engineer,” said Phan. “When you’re in your Structural Engineering classes, you forget that in real life, you’re going not just going to be working with other Structural engineers. You’re going to be working with a Bioengineer, Computer Engineer...” explained Truong. “[Divergent Engineering]’s about being exposed to a bigger picture, earlier on." All students interested in Divergent Engineering are asked to participate in a quarter-long microcontroller workshop where they will have the opportunity to gain a variety of new skills, to be challenged as individuals and to connect with students of similar interests, but in other majors. After completing the workshop, students have the flexibility to either join a divE team or pursue other projects, such as joining a lab or starting their own business. “We’re constantly trying to expose our members to new challenges, new projects and new people,” said Truong. “We’re an open community and we try to expose students to resources by encouraging them to talk to their professors and finding those hidden gems on campus.” The organization that began with six students, now has had over 60 interested applicants and over 30 members that represent every department of the Jacobs School of Engineering. Divergent Engineering has approximately 20 interdisciplinary engineering projects that vary from a glove-remote controlled car to 3D printer made of recycled parts. The organization has grown tremendously in last few months, to which the founders credit their dedicated team members as well as the Electrical and Computer Engineering department, the Gordon Engineering Leadership Center and the von Liebig Entrepreneurism Center for guidance and support. “As a self-funded team, we know that it’s the passion of the students that continue to make this work. We have an extremely strong group of members,” said Truong. “They know that their membership fees go toward buying supplies for the workshop and the workshops fund projects. They value their education and want to contribute.” In the beginning of Winter Quarter, Divergent Engineering had 12 students participate in the workshop and new members who joined different projects. Morris, Phan and Truong knew they wanted to continue offering the workshop to more students and looked for resources on campus. “The donation from the von Liebig Entrepreneurism Center could not have come at a better time,” Phan explained. “von Liebig allowed us to be ambitious and to pick up new members."